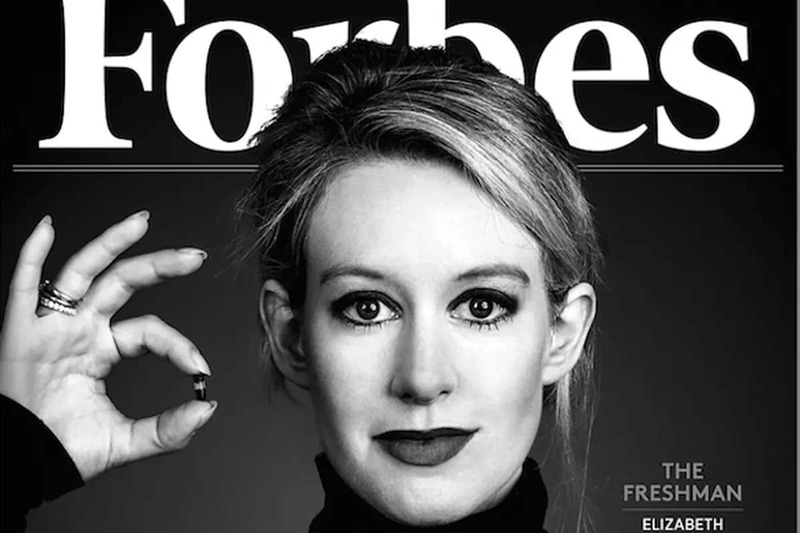 Cover of Forbes 400 Sept 2015 issue: "The Freshman: Elizabeth Holmes leads the class of 2014"
How could Theranos get away with fraud for such a long time? Available as a six-part series with each episode about 45 minutes in length, it makes for a riveting listen, especially those in the molecular diagnostics field. Theranos lost $700M of investor money over the course of 15 years, while trying to develop a microfluidic point-of-care test device. In the end, the company’s story was revealed to be a fraud, and the principals of Theranos are under investigation by the SEC. Theranos (so named as a combination of the words ‘Therapy’ and ‘Diagnostic’) promised to evaluate over one hundred analytes from ‘1/100th to 1/1000th’ of a blood draw from a vein, basically a lancet pin-prick ‘single drop of blood’. In brief, in 2013 the drug-store Walgreens partnered with Theranos to get its microfluidic devices in more than 40 of Walgreens “wellness centers” in the Southwest, and this announcement powered the valuation of Theranos to billions of dollars. At its height, Theranos was valued at $9B, and here is a great roundup of the all the hype and magazine cover-stories surrounding the company and its founder. An example of the cover-story ‘hype’ is this cover story in Fortune titled “This CEO is out for blood”. The sky-high valuation of a Silicon Valley startup was driven in-part by disrupting the overall value of the in-vitro diagnostics business model, estimated to be a global $65B. In addition to collecting blood via fingerprick and the over 100 tests it can perform, it was going to do this in four hours and charge only 50% of the Medicare reimbursement rate. And a large percentage of the existing global diagnostics business is in the central-laboratory model rather than the nascent point-of-care laboratory device, where two of the largest Quest Diagnostics and Laboratory Corporation of America (Quest is in line for $8B in 2018 revenue, and LabCorp recently reported $11.3B in revenue). In the first of many articles, in October 2015 Wall Street Journal piece investigative reporter John Carreyrou published a piece titled “Hot Startup Theranos Has Struggled With Its Blood-Test Technology”. According to former employees “at the end of 2014, the lab instrument developed as the linchpin of its strategy handled just a small fraction of the tests then sold to consumers”; the highly secretive company was later shown to have switched to conventional laboratory molecular diagnostic testing equipment from major vendors in its CLIA-certified laboratory to produce results instead of the point-of-care devices. Walgreens sued Theranos in November 2016 for $140M in damages and later settled out-of-court for $30M. The author of the aforementioned Fortune cover story subsequently published a ‘protracted correction’ to the original story, entitled “How Theranos misled me”. A major criticism of Theranos during this time was the lack of peer-reviewed publications, only a cascade of journalism and filed patents, some 82 in the US and 189 abroad. As of 2014, 18 patents were granted in the US and 66 internationally. During the period of rising doubts about Theranos in the spring of 2016, the only peer-reviewed publication about Theranos technology appeared in the Journal of Clinical Investigation by a group from the Mount Sinai Icahn School of Medicine (Kidd B.A. and Dudley J.T. et al J Clin Invest 2016). With samples from 60 healthy adults, the Mt. Sinai group examined 22 common laboratory tests via the Theranos technology along with two major central laboratory testing companies (Quest and LabCorp). It is notable that this research was sponsored by Mt. Sinai. Theranos flagged tests outside their normal range 1.6× more often than other testing services (P < 0.0001). Of the 22 lab measurements evaluated, 15 (68%) showed significant interservice variability (P < 0.002). We found nonequivalent lipid panel test results between Theranos and other clinical services. Variability in testing services, sample collection times, and subjects markedly influenced lab results. While laboratory practice standards exist to control this variability, the disparities between testing services we observed could potentially alter clinical interpretation and health care utilization. Greater transparency and evaluation of testing technologies would increase their utility in personalized health management. It is notable that no peer-reviewed publications ever came out of Theranos. That summer of 2016, at the annual American Association for Clinical Chemistry, the Theranos CEO Elizabeth Holmes gave a special session presentation in Philadelphia. The AACC is the trade association for clinical laboratory professionals, an appropriate venue for practical advances in the field of clinical diagnostics. Being in Atlanta myself for that particular conference as an exhibitor, the scientists who attended the Holmes’ presentation could tell me ‘she had no data to present’, and expressed lingering doubts about their underlying technology. Theranos could get away with a poorly performing device (and running conventional laboratory tests even in a purported point-of-care environment like Walgreens) by running their own CLIA-certified laboratory with their own Laboratory Developed Test (LDT). This ‘LDT loophole’ was proposed to be regulated in 2016 under the Obama Administration, only to be deferred to the current Administration. The ABC podcast interviews a Walgreens customer, who was clearly puzzled that after going to a specific Walgreens drugstore in Palo Alto to use the Theranos technology (it was advertised in an in-store display), was asked to give blood with conventional venipuncture. Theranos was able to propagate the fraud of conventional laboratory testing by running many of its tests as an LDT, with conventional central-lab equipment. While Theranos did get a 510(k) clearance for a single analyte (Herpes Type 1) in 2015 the FDA filed two form 483’s against the company that same year, for shipment of its collection vials (a Class II device) and for lacking an internal audit schedule for their Quality Management System (QMS). The Laboratory Developed Test system is essential for innovation in diagnostics. There are an estimated 100,000 LDT’s in the United States, of which about 60,000 are for molecular genetic tests, offered from approximately 11,000 laboratories. Just in December 2018 the FDA has proposed a new regulatory framework for diagnostic tests, where 10% of diagnostics would require premarket review. The 10% would be “novel, higher risk, marketed directly to consumers, used at home, or cross-labeled for use with a drug or other therapeutic products”. The FDA standard is ‘safe and effective’, and through the Theranos experience one can argue that while prolonged, the FDA did their part in regulating what was in their purview in the existing LDT framework. The FDA found fault with the blood collection device that was shipped between states (the Theranos ‘nanotainer’ device as an FDA Class II instead of Class I) and also found fault with an internal QMS is setup for audits properly. An FDA audit is taken seriously, and despite all the drama around Theranos from a financial fraud perspective, the 700 employees there on the research, development and clinical roles were not deceptive in their work. Now bankrupt and under investigation, it remains to be seen what happens to the Intellectual Property filed by Theranos, as well as the outcome of the investigation and other lawsuits. Yet to hear the voices of former employees of Theranos first-hand on the podcast is heart-wrenching, as they were clearly manipulated and cut-off from communicating with each other. “Basically, Theranos is the old story of greed, fraud and credulity. Common sense and scientific doubt are the only remedies.” (Lackner 2018). Singlera Genomics will not be offering a Laboratory Developed Test, but rather is in the process of both seeking FDA clearance and publishing the results of both its PanSeer and ColonES early cancer-detection technologies. Here’s a GenomeWeb description of Singlera from last October with many details (subscription required). And unlike Theranos, Singlera Genomics is happy to discuss our technology and potential collaboration with anyone interested.